There are a lot of reasons why Ruth Elizabeth (Lizzie) Bentley is at the top of my ancestors-I-wish-I-could-meet list. Here are a few of them. 1) Although born hearing, Lizzie became deaf after an undisclosed illness when she was three. The only deaf person in her family, she somehow figured things out until, at eleven, she was sent off to the Deaf and Dumb Institution in Halifax, Nova Scotia. Miles from home, she not only figured things out some more, she found a husband (Robert G. Tupper, who was born deaf). 2) Lizzie collected photographs. In 1872, her older sister Jane presented her with an album to keep them in. 3) Lizzie and Robert raised two wonderful children. I got to meet one: my great-grandmother Bertha Evelyn Tupper, who lived to be 98 years old. Here she is at threee, but when I knew Bertha she was almost one hundred years old--and smart as a whip and deaf as a post (according to my mother). Bertha apparently took a ballpoint pen to her mother's album. 4) Lizzie was nice. Her father-in-law wrote of her on 14 May 1889, "Lizie is very kind I think more of her ever day". Lizzie and Robert were living with and caring for Robert's parents (Samuel Tupper and Martha Howard) and by 1891 Samuel would have some painful digestive issues and Martha had some sort of dementia. It cannot have been easy, but she did it with grace. 5) She lived to be 99 years old. My father, who was her great-grandson and was four when she died, remembered her teaching him an old style of sign language, spelling words into his hand. ∞) But the main, undeniable reason I want to meet Lizzie is her album. I have become the guardian of that album and, because of her, I not only can see the faces of many these lovely people, but also own a stack of photography and fashion reference books that I can get lost in. Many of the pictures are on this site, as I try to analyze them as best I can. So for all of Lizzie's grit and kindness (a great combination, honestly), I would be willing to travel in time if she would just tell me who the hell all these people are. I love this picture. The kids are adorable, they are obviously siblings (look at those little faces: identical, even if one is a little grumpy), and can you see those sweet little toes? I feel a bit sad that I will most likely never know who they are. But I do have children in my tree (obviously); I wonder if I can narrow these two down at all. I think she can't be more than three and he no more than five or maybe six. Again, I am not an expert, but I'm going to walk through what I do know, and see if it gets me anywhere. Please take it with a grain of salt and feel free to point out flaws in my reasoning or interpretation! Ok. This photograph was tucked inside Ruth Elizabeth Bentley's album, so it could be connected with the Bentley family, the Tupper family (which she married in to), or the deaf community of Halifax, Nova Scotia. It was pasted in a scrapbook at one time, however (see all that black paper, below), and I wonder if Lizzie used a scrapbook before she was given the album in 1872. As for the type of picture: this is unquestionably a carte de visite. What jumps out first to me is that this card has two gold borders around the edge, one thicker and one thin, and PhotoTree says that that border was popular between 1864 and 1869. That is just lovely from my point of view; it narrows everything down considerably. However, I'd feel better with a bit more confirmation than that; isn't it possible some of those gold-bordered cards were lying around a little bit longer? a relatively simple painted background, which had become "garish" by the late 1870s (according to Darrah, pg 33). Luckily there's photographer information on the back, although it's partially obscured. Luckily, I recognize the street name as being from downtown Halifax, Nova Scotia. Even better: I have another photo that reveals all his details. To the city directories! Library and Archives Canada has a selection of directories from all over the country available (and searchable) online at Canadian Directories: Who Was Where. It's certainly not complete, but the Halifax coverage is pretty good: I was able to find James Ross, photographer, at 197 Hollis Street continuously for twenty years from 1868 until 1888. * Excellent. Now the clothing. It has been more difficult for me to date the children's clothing; there aren't as many examples out there and the styles seem to change more slowly. There is, however, one picture in Dressed for the Photographer by Joan L. Severa that shows a little girl in a ca 1862 dress trimmed with dark soutache braid that looks very similar to the trim on my girl's dress (pg 217). Popular throughout the 1860s, Severa says, "little girls' dresses were not ruffled or excessively fluffy at this time, and most had the soutache braid trim" (pg 210). She goes on to say, however, that this style continued to be popular into the first three years of the 1870s, when dresses had a "trimming of soutache braid patterns and usually a back bow or belt set rather low" (pg 315). Lovely. The little boy, on the other hand, is wearing a Zouave-style jacket tied at the neck with a little white stand-up collar. A tiny bit of waistcoat peeks out underneath. He wears long trousers tucked in to knee-high boots. In the 1860s, "littler boys were also often dressed in suits consisting of a full white shirt with trousers and a short jacket, the latter usually fastened at the top only and curving away at the front edges; the Zouave and the bolero style of jacket were both featured" (pg 211). There is a photo of a young boy at PhotoTree dated 1871 with a similar style jacket, long pants, and tall boots (third row down, third from left). The McAlpine City Directories for Halifax from years 1868-9 through 1900-1 are avilable online at Canadian Directories: Who Was Where. I also used the McAlpine Nova Scotia Directory for 1867-8 and the Hutchinson's Nova Scotia Directory for 1864-5 and 1866-7. The Wisconson Historical Society Children's Clothing Collection. Wonderful. Search for images of actual clothing by decade. Library and Archives Canada for the 1881 and 1891 census returns. www.novascotiagenealogy.com revealed James Ross's marriage and death register in Halifax, Nova Scotia. A browse through PhotoTree was helpful. *More about James Ross: James Ross, photographer, was born 12 Feb 1836 in Scotland, the son of Donald and Janet Ross. I first find him in Halifax listed in the 1866/7 directory as a photographer, but with only a home address listed (Garrish Street). I wonder if he was employed at the time. But on 14 May 1867 he married Hannah Richardson of Halifax; they then found a family home at 9 Moran Street and promptly began having children. The next year he set up shop for the first time at 197 Hollis Street. In the 1881 census, James Ross's son (named James A. Ross) was working as a photographer as well. I imagine they were working together, the father teaching the son the photography business, as only one James Ross is listed in the directories at that time. By the 1891 census, James Ross Sr. is working in Photo Stock, while his son has become the photographer. At any rate, the 1889-90 directory shows that James Ross of 9 Moran Street has moved his photography business to 161 Barrington Street, a location right in the middle of downtown and considerably closer to his home. James Sr. died in Halifax 26 August 1906. Before I begin, I love Maureen Taylor's blog, Photo Detective. This week my ancestor is up for worst hair in (possibly) photographic history. If you see this before Sunday, April 10, please go through and vote for me! My picture is of Sophie Bentley (doesn't she look like fun?) and you can vote through this post. I could win Maureen Taylor's latest book on dating hairstyles. Thanks! Now, a disclaimer: I am certainly no expert on dating photographs. Take everything here with a grain of salt; I'm just trying to figure this stuff out and learning new things every time. But here's how I go about trying to learn more about an image. I've always liked this lady; I think she looks kind. Plus, I find her clothing interesting. But I haven't really worked on this particular picture for two reasons: I have no idea who she is and there is no photographer information to get me started. Intimidating. What I do know about it: this photo came from the album owned by my GG grandmother, Lizzie Bentley. That means this lady may have a connection with the Bentley, Tupper, Ells, or Howard families of Colchester County, Nova Scotia. Since Lizzie was deaf, this lady could also be part of the deaf community. Something else I can't mess up: this is a tintype. The tintype was first introduced in 1856 but continued to be popular right up until the early 1900s; that's not so helpful. Thankfully that paper sleeve is much more datable. In fact, there are words on the right side of the paper sleeve: PATENT MARCH 7 1865. According to PhotoTree.com, the embossed style of paper frame here was first patented in 1865 (yup) and was popular into the early 1870s. Yay! That narrows it down considerably. PhotoTree.com is a great site, by the way. You can browse many photos, all with estimated (and some confirmed) dates for comparison. Next up: costume. The first thing that stood out to me is her interesting belt. There's a photo of one in Dressed for the Photographer* by Joan L. Severa, who calls it a Swiss belt. My lady's is black and nicely embroidered. Well, an excerpt of The Dictionary of Fashion History is online and it happens to include a bit about Swiss belts: "Fashionable 1815 and 1816 [nope; before photography]; again in 1860s, 1880-1900. A waistband broadening in front to a lozenge shape, pointed above and below" (pg 200). Discovering your Ancestry through Family Photographs says wide belts were popular in from 1860 to 1865 (pg 67). So now we are narrowed down a smidge from 1865 to about 1870, but probably closer to mid-decade. I also can't help but notice how full her skirt is. I'm pretty sure it used a hoop; according to Dressed for the Photographer, "during the midsixties...the wearing of hoops had become so universal and expected that any woman without one was the object of unwelcome attention" (pg 201). Her sleeves are pretty wide as well, and her shirt has small buttons down the front. She is wearing some sort of long necklace with a slide, and has a bracelet on each wrist. All of these details seem to be consistent with our mid-sixties estimate. Now hair. Our lady's hair is parted in the middle and smoothly tied behind her head, leaving the ears visible. Another great part of PhotoTree is the ability to view all photos with confirmed dates in a certain time period. Check it out: our lady seems to have a fashionable hairstyle for the 1860s; by the 1870s, hair was much...bigger. So, I think the date range of 1865-1870, but probably closer to 1865, is about as good as I am going to get. I'm happy! That was during Lizzie Bentley's time at The Deaf and Dumb institution; could this woman be associated with the school? I may not know who this lady is, but at least I know a bit more about her. And it was kinda fun, right? *This book was a splurge, but it is absolutely fascinating. The descriptions of costumes found in portraits are incredibly detailed. Actually, they are so much so that I think The Dictionary of Fashion would helpful to use with it; I don't always get what things like "point d'esprit" and "Zouave jackets" are (talk about a splurge). This is really kind of a part two to a part one: Deaf and Dumb Institution, Halifax. Lizzie Bentley, my GG grandmother, was not born deaf. Family lore says she lost her hearing due to an accident at the age of three, which is not unheard of. It is, however, more likely that she had an illness; at the time, Scarlet fever was the leading cause of deafness other than heredity. Of course, there was still a lot of speculation in the latter part of the 19th century, most of it rather unflattering to the families: poverty, negligence, inbreeding, and damp and ill-ventilated buildings were all suggested causes. Scaring a pregnant woman, at least, was no longer thought to be an issue. The Deaf and Dumb Institution in Halifax was, by necessity, a boarding school. It took in students from all over the Maritime provinces and even a few from the US. By the time Lizzie attended, they averaged forty students a year. There were three teachers--including the principal--and, therefore, three classes. This put a broad range of students in each class and made teaching difficult. Hutton goes on to explain that he doesn't believe audible speech and lip-reading are attainable for most students. Well, attainable or not, it seems unlikely that Lizzie and Robert would have learned it at Hutton's school. Instead, they would have been taught to to read and write--"the principal source of knowledge and the grand instrument of communication"*--and to use sign language. They learned Natural Signs (basically, if I understand it correctly, acting out things as well as you can so that anyone could understand them) as and the one-handed and two-handed alphabet. Once communication was established, a general education of history, geography, and whatnot could begin. The curriculumn was designed and honed over the years, and in the 1870s Hutton published a series of textbooks, several of which are available online at Kobo. I particularly like the language lesson book, which is peppered with little notes to the student that vary from the friendly, "Good morning! How do you do?" to the stern, "Be quiet. Sit in your seat." and the rather questionable, "Don't be inquisitive." Humph. J. Scott Hutton, "Deaf-Mute Education in the British Maritime Provinces," American Annals of the Deaf, Volume 14 (Raleigh, N. C.: Press of the Institution for the Deaf and Dumb and the Blind), pg 65-82. George Hutton, "Practicability and Advantages of Writing and Printing Natural Signs," American Annals of the Deaf, Volume 14 (Raleigh, N. C.: Press of the Institution for the Deaf and Dumb and the Blind), pg 157. J. Scott Hutton, Language Lessons for the Deaf and Dumb (Halifax, N. S.: The Pupils at the Institution Press, 1878). I've known that we had deafness the family since I was little. My father still remembered some of the sign language he learned to speak to his great-grandmother, who died just a few days short of her 100th birthday in 1950. He said she used an older version of sign language, different from ASL. But when I first starting delving in to the details of Ruth Elizabeth Bentley and her husband Robert Tupper, I had no idea how fascinating it would all be. Robert's parents, Samuel and Martha (Howard) Tupper, had ten children and three of them were born deaf, all male. John Creelman Tupper came first in 1835. Then Robert G. Tupper (my GGG grandfather) on 10 Sep 1837, and later on Franklin Tupper, born on 18 Sep 1851. At the time, in Nova Scotia, there were few options for educating a deaf child. The nearest school was in Quebec, which had opened just a few years before John was born. It was almost 600 miles away and most likely French. Another option would be to find a private educator, but how practical (or expensive) that would be, I'm not sure. I'm also not sure what sort of formal eduction these Tupper boys would have received, but what I do know is that John (then 21) and Robert (19) were first in line for an education when the Deaf and Dumb Institution first opened its doors. Franklin attended the school as well. The school was the brain child of two deaf men from Scotland, who had both attended the same school for the deaf in Edinburgh and then ended up immigrating to Nova Scotia and running into each other again. George Tait was a carpenter; William Gray a tailor. Apparently there was some dispute later over who actually founded the school, but generally the story goes that Gray was underemployed and Tait was tutoring a young deaf girl (although in some versions Gray was doing the tutoring) when Tait began to urge Gray to become a teacher of the deaf. Gray agreed, the men set about raising funds and, in Tait's case, building the desks for the classrooms. They opened shop on Argyle Street in 1857 with just four children. Two of them were probably John and Robert, who started in 1857 at some point. The Deaf and Dumb Institution, ca 1876. Here's a photo. Shortly thereafter, the school took off. Clearly there had been a need! Students came from all over the Maritimes. Thankfully, government grants and private donations allowed the hiring of a trained teacher, J. Scott Hutton, also from Edinburgh. Soon after his arrival, however, Scott was begging his own father, still in Scotland, to join his over-worked teaching staff. Mr. George Hutton had been teaching the deaf for over forty years already, and he did come to Halifax where he worked for the next ten years (without pay!) until he died in 1870. I imagine that the new school brought the deaf community together for the first time. The Tupper boys certainly made friends and both John and Robert found wives at the school. J. Scott Hutton translated the ceremony at Robert's wedding (in 1873 to Ruth Elizabeth Bentley) and John and Robert's hearing sister, Cynthia Amelia, married George Tait, the man who helped found the school! Edward Allan Fay, editor, Histories of American Schools for the Deaf, 1817-1893 Volume III (Washington, D.C.: The Volta Bureau, 1893). It's available through Google books. Joseph C. Gordon, editor, Education of Deaf Children: Evidence of Edward Minor Gallaudet and Alexander Graham Bell (Washington, D.C.: The Volta Bureau, 1892). Also available through Google books (love Google Books!). I have no idea who this lovely lady is, so I'm working with what the little I've got. Although the bottom of the words are cut off, I think I can see Swain and Yarmouth there. Sure enough, L.G. Swain was a photographer newly set up in Yarnmouth, Nova Scotia, according to Hutchinson's Nova Scotia Directory 1866-7. Mr. Swain is still there in the 1870-1 McAlpine's directory and the 1881 census, although I don't see him in 1891. Ad for L.G. Swain in 1866-7 directory. Photo Detective had a photo up recently that shows similar frizzy bangs, slimly-shaped long bodice, long line of buttons, and slim arms. That picture is from the early 1880's and I'm thinking this one might be too. And check out all these 1880's hairstyles! Fits right in, don't you think? This stuff is fascinating, honestly. Shown in the above photograph are Mr. and Mrs. Donald E. Conroy, who were recently married in Truro. Mrs. Conroy is the former Miss Ruth Boomer, daughter of Mr. and Mrs. S. W. Boomer, Alton. Mr. Conroy is the son of Mr. and Mrs. W. D. Conroy, Middle Stewiacke. This picture is part of a collection owned by Janet Rogers, who kindly agreed to display it here. The collection came to Janet from her grandmother, Gladys McNutt, who was the granddaughter of Ferdinand Brock Tupper (through his daughter Flora). 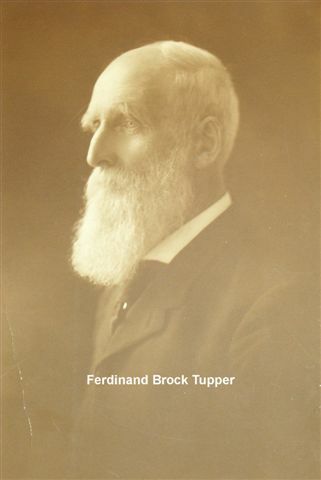 This is Ferdinand Brock Tupper in his later years. He was the fifth son of Samuel and Martha, born on 20 Oct 1839, and married to Hannah (their family is mentioned in the Letter to Amelia from her Father, April 16, 1891). Brock, as he seemed to be called, had five girls with Hannah: Flora, Ada, Ella, Maggie, and Rachel. This is a letter I have in my possession that was written May 14, 1889 from Samuel and Martha Tupper to their daughter Cynthia Amelia (Tupper) Tait. I found this among other letters written to Bertha Evelyn (Tupper) Conroy, Samuel's granddaughter. At the time the letter was written, Samuel and Martha were living with their son Robert, his wife Elizabeth Tupper, and their daughter Bertha. Amelia was living in Dartmouth. I don't know why it was back in Bertha's possession. I'm not sure who Aunt Betsy is. Samuel had an aunt Elizabeth on his father's side, but she would have been really old (almost 100), so it probably wasn't her. Maybe Martha had an Elizabeth in the family. The Jane he refers to is Jane Bentley, Lizzie's older sister. Jane was living with Robert and Lizzie in 1901, and may have been as early as this letter (or she might have just been visiting, as both of her parents were still alive in 1889). Samuel apparently didn't think much of her.